At SWC True North Wealth Management we are more than conventional financial planners*. We’re passionate about our clients’ entire financial lives. We have a unique approach to understanding your financial goals. We use a dynamic process based on the life you want to lead and continually adapt to the changing world and your needs. We believe that financial goals should be well-defined and attainable with a sound plan that allows you to chart your progress. Together, we’ll use research-based tools and sound investment* strategies to create a clear picture of your financial life. 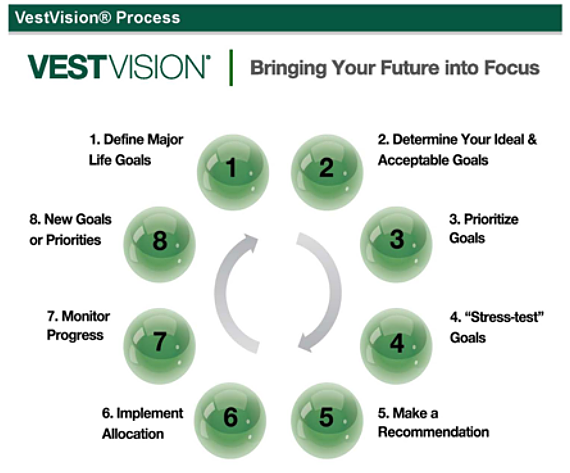 While creating your financial plan we utilize VestVision, an eight step process to help you reach your financial goals. VestVision is an investment* and retirement planning system that provides our financial advisors and you with the tools and technology needed to identify and prioritize your life goals, decide on an appropriate investment strategy, monitor your progress, and make revisions whenever necessary. The result is your ability to be confident in your plan and approach the future with optimism.